Amazon made headlines this month when it sought permission from the U.S. government to test its drone-based delivery service, but it’s far from the only company that’s applied for such approval. 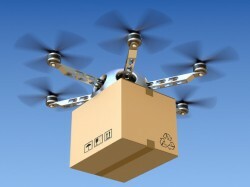 The FAA allows drones to be flown under the existing model aircraft regulations, but only for “recreational or hobby purposes, and within the visual line of sight of the operator.” Commercial flight is specifically prohibited, and companies wanting to test drones for commercial use must obtain an exemption from the FAA. Trimble Navigation is one such applicant. It’s best known for GPS navigation systems but also makes products for surveying land, such as construction sites. It wants permission to fly its UX5 drone, which takes high-quality images used to build contour maps of the area, among other things. Yamaha Motor, best known for motorcycles and keyboards, wants permission to use its RMAX remote-controlled helicopter for agricultural services, which include things like “precision crop-spraying.” The company says the RMAX is already in use in Japan, Australia and other countries. “Yamaha seeks the exemptions to bring the commercial benefits of the RMAX to the United States,” it says. VDOS Global, a company that deploys drones to collect sensor data in “hostile environments,” wants permission to use an Aeryon SkyRanger drone to inspect gas flares on Shell oil rigs in the Gulf of Mexico. In its application to the FAA, it said using a drone would be much safer than sending a worker for the inspections.